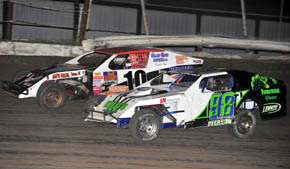 The 2010 summer racing season in Albion officially closed with a roar Friday, Aug. 27, as a large field of cars vied for the lucrative purse in the annual Boone County Raceway Shootout. When the dust settled late Friday night, four drivers emerged as feature race winners on the final night of action at the fairgrounds oval. Andy Gregg of Lincoln won the Hobby Stock A Feature, Doug Adamy of Columbus took home the Stock Car A Feature hardware, Albion’s Tyler Iverson swept to the Modified A Feature checkers and Tad Behmer of Winside concluded Late Model racing with the A Feature victory.